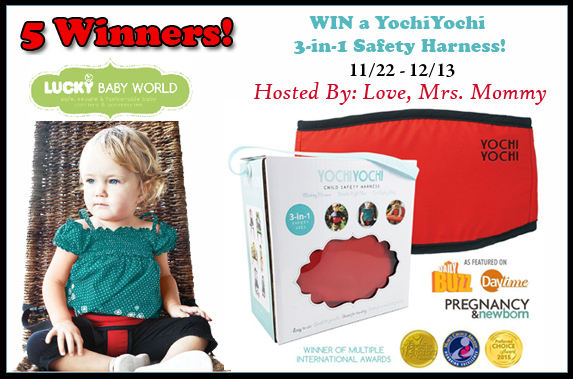 Love, Mrs. Mommy: Blogger Opp: YochiYochi 3-in-1 Safety Harness Giveaway! 5 Winners - $135 TRV! Blogger Opp: YochiYochi 3-in-1 Safety Harness Giveaway! 5 Winners - $135 TRV! Love, Mrs. Mommy is hosting a 5 WINNER giveaway that's for the little ones in our lives! Up for grabs is a YochiYochi 3-in-1 Safety Harness! It's been featured in Pregnancy & Newborn and has received a number of international awards!